Saturday we were in Journeys for Kids attempting to find my growing boys feet some new shoes. We were on a mission to find some Toms for kids. As much as I LOVE buying online, there are some things in life that I want NOW. So we are in Journeys for Kids and I ask the sales dude if they had Toms, he said  NO, BUT he had something just as good  Skechers. Do you know the mission behind Toms? WHAT? ARE YOU KIDDING? Those words fell out of my mouth. And went on my merry way. Tonight I logged on to HootSuite to see my tweet retweeted 5 more times, by people I dont know. Whoops. Its funny how what you say can get tweeted and retweeted and posted on walls and yadda yadda. I mean I should know that by now RIGHT? So I opened up the Twitpic to see how many people had viewed my silly image. 380 views. AND after looking closer at the BOBS by SKECHERS Twitpic I snapped  I see Soles 4 Souls logo on the tag and then I started to feel a little rotten. I hadnt noticed that little diddy before. Why rotten? Because though Ive never been a fan of Skechers, Ive always been a fan of Soles4souls. Soles4Souls has given away over 10 million pairs of new and gently worn shoes (currently donating one pair every 7 seconds.) The shoes have been distributed to people in over 125 countries, including Kenya, Thailand, Nepal and the United States. SO should I POUT about Soles4Souls receiving a large donation from Skechers? (Skechers you better be sharing a large sum of that profit!) OR Should I be upset with a BIG brand like Skechers finding a way to cause market? No. Cause marketing is a good thing. BUT SKECHERS CAN YOU PLEASE BE MORE ORIGINAL? come on.. it is one thing to knock off with a similar name with a similar mission, but couldnt you create an original shoe?!?!? Read the latest on this saga. Toms denounces any connection to Bob Shoes. My knee-jerk reaction to the sales dude was most likely 2 reasons. SO to be FAIR, I am trying to do some research to find out more about this whole thing. I have checked out Skechers site for BOBS by Skechers and have found nothing. I have looked on Soles for Souls site  and again nothing on this Bobs shoe partnership. Canvas slipper from Skechers featuring allover sparkles and a comfy sole. Buy a pair of BOBS and Skechers will donate a pair of shoes to a child in need through Soles4Soles! So here I am at the end of the post. Happy that kids will have shoes, everyone deserves SHOES. But mad at the MAN (Skechers) who has to copy in order to compete. Competition is good. Copying is LAME PEOPLE! As for me and my family, our feet are loyal to Toms. Want to help put shoes on a kid’s feet? Just donate your slightly used shoes! If your kids’ feet grow as fast as my kids’ feet do  you should have NO PROBLEM finding shoes that have barely been worn to drop off! 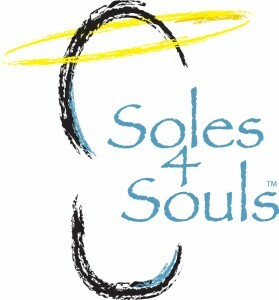 Soles4Souls has a drop off location most likely near you! Photo Shoot With My Kids – Lessons Learned.